This is departmental accounting and measurement system for the metered fuel supply from tank trucks for fuel with a limit schemes recipient identification on the radio card. 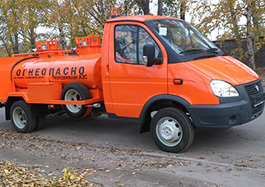 1) Fuel dispenser "Topaz-810" It attaches on the chassis of a lorry in the most suitable position. It provides fuel quantity measurement, that pumped a pump unit in the vehicle tank or machinery, and carrying out the dosing at the same time. It contains an electronic reading device with a liquid crystal display and interface management. 2) Minicomputer "Topaz-186" It set up in the tanker cab and provides identification of the recipient of fuel, management of fuel dispensers, entry into the internal memory of the information on transactions, exchange information with the office computer via the built-in GSM-modem. 3) The keyboard and display module "Topaz-188" Located on the spot tanker cockpit that provides simple access for driver-operator. Made with a sturdy metal case, which includes card reader, metal 16-button keypad and LCD display. It allows operator to control the complex. 1) Software "Topaz Independent filling" Installed on PC or server. It provides the ability to create, edit and remove the data on the electronic database records, that consist of card codes and the details of their owners’ requisites, permits to obtain fuel (limits on the amount and term), the parameters of each fuel delivery for each tanker. Through the Internet it is able to communicate with any tanker at any given time, providing the updated operation information by an operator or automatically on a predetermined schedule. Connects to a computer and allows reading the card code for its inclusion in the software database.